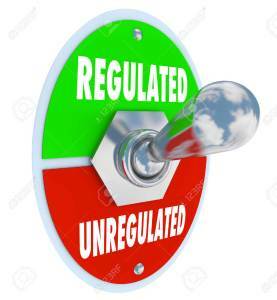 As we all know, one of the things that we should always look for in the broker is the regulation. Unfortunately, binary options have become a target for many fraudulent schemes and people who are trying to use the system to rob people. Hundreds of binary brokers already operate on the Internet. And we recommend not to deal with most of them. But why? And which broker is, therefore, the right one? Let’s take a look. Surely you’ve heard or read somewhere that a good broker must be regulated. And since most brokers are not, we cannot trust them and deal with them. However, this issue is not so simple. There are also brokers who are trustworthy, even though they are not regulated. How come? The regulation is usually a good sign that the broker is trustworthy and will not disappoint you. However, this rule does not work every time. Regulation is not the only sign of how good of a service a broker provides. Which is the reason why some unregulated brokers provide a very good service. The biggest reason is undoubtedly the opportunity to defend yourself against the bad things under the supervision of regulators. It works like this. Binary brokers who are regulated have to abide the rules from a regulatory authorities such as CySEC. These policies were designed to protect us – traders. If a broker wants to remain regulated, they shall not break these principles and rules. And if they do, they might be suspended and all clients will be returned their investments. First – if we decide to trade only with regulated brokers, we will miss on brokers such as 24Option – one of the top rated brokers in the world. 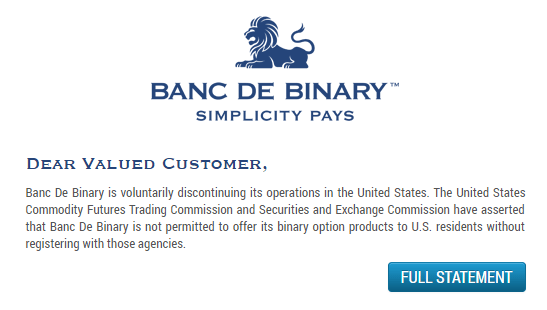 Banc De Binary is voluntarily discontinuing its operations in the United States. So in theory: regulated brokers could allow traders to trade from the US, but only if they are registered with the CFTC regulatory authority. And that means that they could not trade currencies or commodities. When you find a broker that you like and is not regulated – do not throw him into hell. It would be worse if they were not regulated and claimed the opposite. Which, in fact, happens! It is recommended to google for user reviews on a broker. This can help you. However, look at the reviews on several sites, to increase objectivity. Begin slowly. Deposit $200 and trade. Then withdraw some amount and see how everything is going. Good luck.